In 1987, the United Nations Educational, Scientific and Cultural Organization (UNESCO) placed the Great Wall on its list of the world’s great national and historical sites. During its construction, the Great Wall was called “the longest cemetery on earth” because so many people died building it. Reportedly, it cost the lives of more than one million people. The Great Wall of China is also known as the wanli changcheng or Long Wall of 10,000 Li (a li is a measure of distance, approximately 1/3 of a mile). The main wall is around 2,145 miles (3,460 km) long with an extra 1,770 miles (2,860 km) of branches and spurs. The most visited section of the Great Wall is in Badaling, close to Beijing, which was built during the Ming Dynasty. It was the first section of the wall to open to tourists in 1957. It is where Nixon visited and was the finish site of a cycling course in the 2008 Summer Olympics. As early as the seventh century B.C., a number of smaller walls that served as fortifications and watch towers had been built around the country. Initially each state (Chu, Qi, Wei, Han, Zhao, Yan, and Qin) that would be united in the first Chinese empire had its own individual wall. The dynasties after the Qin which seriously added to and rebuilt the Great Wall were the Han (206 B.C.-A.D. 220), Sui (A.D. 581-618), Jin (115-1234) and, most famously, the Ming (1368-1644). What survives today are the stone and brick walls predominately from the Ming dynasty. It is common to hear that the mortar used to bind the stones was made from human bones or that men are buried within the Great Wall to make it stronger. However, the mortar was actually made from rice flour—and no bones, human or otherwise, have ever been found in any of the Great Wall's walls. According to legend, a helpful dragon traced out the course of the Great Wall for the workforce. The builders subsequently followed the tracks of the dragon. A popular legend about the Great Wall is the story of Meng Jiang Nu, a wife of a farmer who was forced to work on the wall during the Qin Dynasty. When she heard her husband had died while working the wall, she wept until the wall collapsed, revealing his bones so she could bury them. At one time, family members of those who died working on the Great Wall would carry a coffin on top of which was a caged white rooster. The rooster's crowing was supposed to keep the spirit of the dead person awake until they crossed the Wall; otherwise, the family feared the spirit would escape and wander forever along the Wall. Uranus, or Tianwang, who was the personification of Heaven, is often portrayed on the reliefs found at strategic points and passes on the Great Wall. During the Ming dynasty, nearly one million soldiers were said to defend the Great Wall from “barbarians” and non-Chinese. The manpower to build the Great Wall came from frontier guards, peasants, unemployed intellectuals, disgraced noblemen, and convicts. In fact, there existed a special penalty during the Qin and Han dynasties under which convicted criminals were made to work on the Wall. 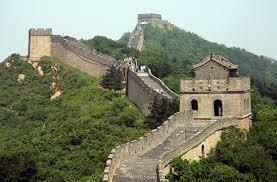 Before the Ming dynasty, the wall was built with rammed earth, adobe, and stone. About 70% is made from rammed earth and adobe. Bricks were used after the Ming dynasty. A section of the Great Wall in the Gansu province may disappear in the next 20 years due to erosion. Watchtowers were built at regular intervals along the Great Wall and could be up to 40 feet tall. They were used as lookouts and fortresses as well as for housing garrisons of troops and stockpiled supplies. They were also signal stations, where beacons, smoke, or flags were used for messages. They also represented a tremendous diversity of architectural styles. The Great Wall’s western section, with a long chain of watchtowers, provided defense for those traveling the Silk Road. Parts of the Great Wall were surrounded by defensive moats, which were either filled with water or left as ditches. Numerous temples were built along the Great Wall for the worship of the war god, Guandi. The highest point of the Great Wall is in Beijing at Heita Mountain (5,033 feet/1,534 meters). The lowest point is at Laolongtou (sea level).